Published on May 5, 2011 by Wade Shepard Follow me on Twitter here. The Dominican Republic is a great air hub to the Caribbean region, being serviced by budget and major airlines alike. Flights are cheap from New York, Miami, and Ft. Lauderdale. 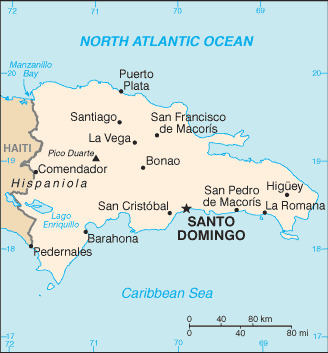 Santiago and Santo Domingo are the most popular entry and exit points in the country. If you have any tips, advice, or suggestions for flying to Dominican-Republic please submit them below. Had a quick question about when you spent the night at Santiago airport in dominican republic about a year ago, as I am planning to do the same thing this evening and came across your blog, Santiago Airport Hotel. After you got to the airport, were you able to check in for the flight and go through security and wait at terminal, or did you have to site outside the counters until check in time. Wifi by any chance at the airport? STI is a funny airport, set up for the tropics. Most all of the waiting areas — besides being at the gates themselves — are outside. There is a dining area on the second floor though that you can wait in as well though. It has free WIFI. The check in booths are also on the exterior of the airport proper. There are a lot of people around, it is just like a normal airport, only half of it is in the open air. Airfare to the Dominican Republic is pretty cheap; around $150 to $200 from JFK. Check out budget airlines; Jet Blue and Spirit Air both fly to Santiago and Santo Domingo. I agree, look for flights on the budget airlines Jet Blue and Spirit Air. I just took a flight on Spirit Air from Santiago in the Dominican Republic to Fort Lauderdale for around 150 USD. I then transferred to a flight to Guatemala City for a little over a hundred. Just be careful with Spirit Air’s baggage allowance policy, they charge a lot for checked bags.